Surgical complications following renal transplantation may be defined as those which require operative intervention for alleviation. Non specific surgical complications such as wound sepsis, peptic ulceration and gastro-intestinal haemorrhage to which the immunosuppressed recipient may be more susceptible than normal are not described in this chapter. The surgical complications are usually technical in origin. 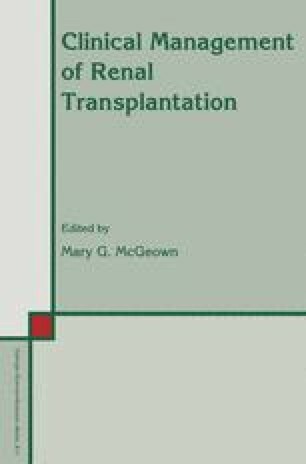 Since the early days of renal transplantation their incidence has fallen dramatically. This is in part due to better technique and a fuller understanding of the anatomy, both normal and anomalous, of the kidney and excretory tract. The introduction of synthetic suture materials for vascular anastomoses has reduced the incidence of complications. The vast worldwide experience of renal transplantation shared at conferences and through publications has been most helpful in managing surgical complications. The number of surgical complications has been dwindling and as a result they may now seem to be more complicated, but with the help of a shared experience, a remarkable number of innovative techniques have been used to salvage allografts which would otherwise have been lost. Nevertheless, life threatening and graft threatening situations still arise and an awareness of these situations is still essential. Apart from haemorrhage and wound sepsis, the surgical complications of renal transplantation usually come to light during the investigation of early anuria or graft failure. A combined medical and surgical approach to the investigation of anuria and early and late renal failure, using minimally invasive techniques is essential.